Large silk ribbon with the text of Pennsylvania Governor Joseph Hiester’s inaugural address. 2015.22.857 Krasik Collection of Pennsylvania and Presidential Political Memorabilia, Heinz History Center. This large silk ribbon displays the text of Pennsylvania Governor Joseph Hiester’s inaugural address given after a significant change in the political process. Early in the 19th century, presidential and gubernatorial candidates were often chosen during meetings, known as a caucuses, of state and congressional legislators. As the 19th century progressed, so did politics. For instance, the abolishment of property requirements for a majority of white male voters by the 1820s expanded the voting pool. In addition, the political party system that many of the founding fathers had tried to avoid evolved following the collapse of the Federalist Party. Challenging issues surfaced such as the national debates over the Second Bank of the U.S., the Panic of 1819, and other conflicts related to state vs. federal responsibilities. As charges of corruption — both real and invented — began to mount against caucuses, combined with early hints of Jacksonian Democracy, the process of nominating candidates by delegates rather than officeholders began to grow in popularity. 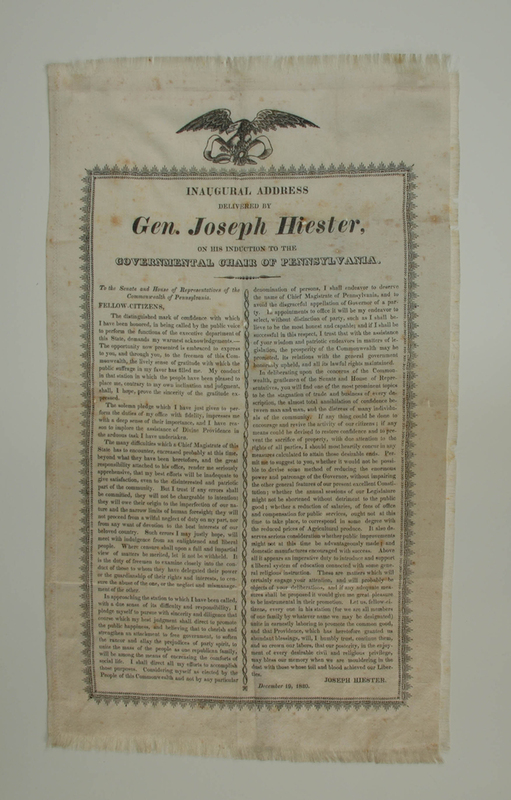 Pennsylvania took part in this expansion of democracy, beginning with the gubernatorial election of 1817, when Democratic-Republican Joseph Hiester was nominated for governor by a convention of delegates instead of a caucus. Though he lost the 1817 election, Hiester was successful in the 1820 election, due in part to the nominating convention process. Hiester frequently mentions being “chosen by the people” in his address. Learn more about political history in Pennsylvania by visiting the History Center’s new Krasik Collection of Pennsylvania and Presidential Political Memorabilia inside Visible Storage. Bowers, Douglas E. “From Caucus to Convention in Pennsylvania Politics, 1790-1830.” Pennsylvania History 56 (Oct. 1989): 276-298. William Findlay, Pennsylvania Historical and Museum Commission. Joseph Hiester, Pennsylvania Historical and Museum Commission. Carrie Hadley is a cataloger at the Heinz History Center.